If you filled out the lupus survey, thank you very much. The results are below - you may find you have to scroll side to side to see everything. In the general population, about 1 in 68 children is diagnosed with an autistic spectrum disorder. Of the 70 lupie parents who responded to the ASD question, 12 had a child or children diagnosed with an ASD. That is clearly well above the amount that would be expected. This fits with other studies which have indicated that children of mothers with lupus might have an increased risk of autism. Again, those studies are few and science is only at the very beginnings of understanding why this might be the case, but we have borne it out in our own little survey. The survey looked at another pet issue of mine - people with invisible illnesses being criticised for using disabled parking spaces. The vast majority of respondents didn't have disabled parking permits. Of those who did, about half used their permit and never had any problems. Of the other half, a small number were afraid to use their permits, and a significant number had received criticism. On the question of the pain experienced by lupies - no-one claimed to be completely pain-free even on a good day. For most people, pain on a good day ranged from 3 to 5 on a ten scale. On a bad day, most lupies reported a pain scale from 8 to 10, with no-one having a pain level below four. Most of us have gut symptoms. About half of us have gut symptoms that are affected by gluten, lactose, or both. A quarter have gut symptoms that aren't affected by either of those. Lactose came off as causing issues for far more people than gluten did, and the majority affected by gluten were also affected by lactose. Brain fog (cognitive dysfunction) is a problem for all except one of us. That one person, I salute you. Most had relatively mild to moderate brain fog problems. About a third were had a more serious issue, regularly forgetting important things or being confused, or even at the point of wondering if they had dementia. There were no surprises in the question of who diagnosed us. The vast majority were diagnosed by a rheumatologist with a GP being the next most common doctor to do the diagnosis. More than half of us took steroids and felt they had caused us to gain weight. About a quarter of us don't take steroids. Eleven people took steroids but didn't notice an effect on their weight. 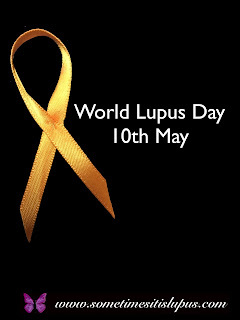 As for the impact on everyday life, more than half of us reported that lupus changed everything. Of the rest of us, most said it had a moderate to serious effect. None of us said there was no change. How long was it between when you first had symptoms and when you were diagnosed? Do you have children diagnosed with Asperger's or another Autism Spectrum Disorder? Have you been criticised for using a disabled parking spot? Using a scale of 1-10 (1 is no pain, 10 is the worst pain imaginable), what is your level of pain on a "good" day? Using a scale of 1-10 (1 is no pain, 10 is the worst pain imaginable), what is your level of pain on a "bad" day? Do you regularly lie to family and friends, and say you are OK or "fine", when you are in pain, fatigued, or suffering other symptoms? Do you have gut symptoms that are made worse by gluten or lactose? Do you have "brain fog"? Have you found steroids (eg prednisone) have caused you to gain weight? How has lupus affected your day-to-day life?